We had long wanted to visit the Scottish Highlands. We wanted to see the purple heather, the yellow gorse, the green moss. 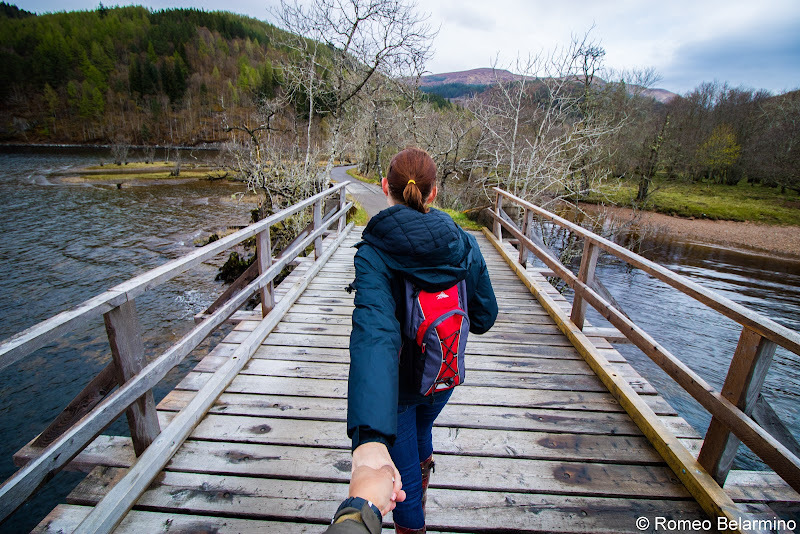 We wanted to enjoy the Scottish Highlands slowly, hiking and communing with nature. 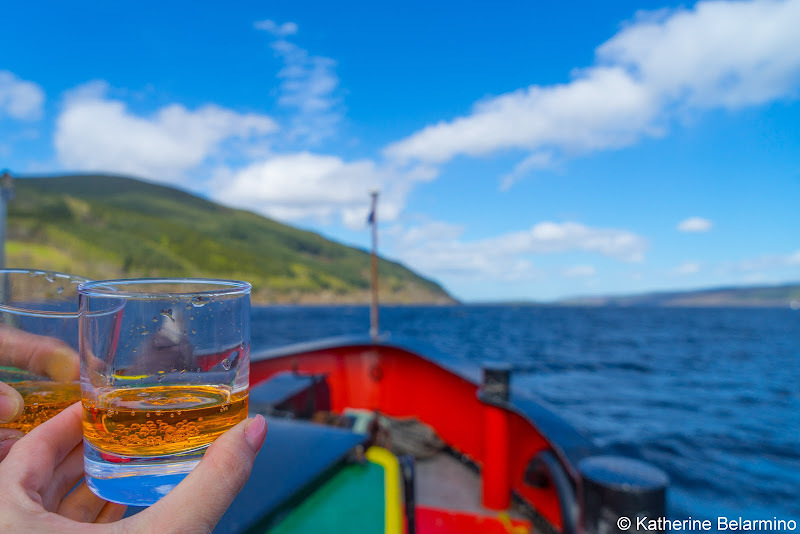 While we love road trips and spent a few days road tripping through the Scottish Highlands by car visiting Scottish castles, distilleries, and cathedrals, we were excited to try out a different way of experiencing the Scottish Highlands, on a Scotland Cruise with Caledonian Discovery. We weren’t quite sure what to expect on our Scotland Cruise. After all, this was only the second cruise we had ever taken, our first being a European river cruise with Viking River Cruises. 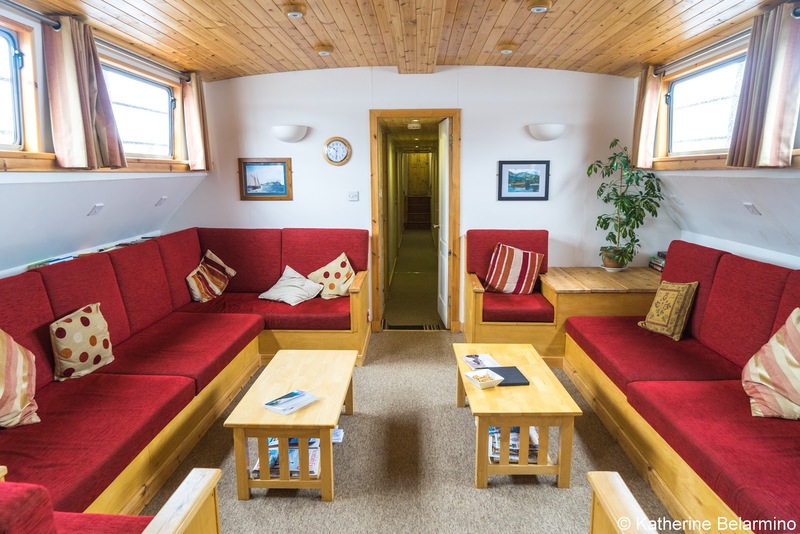 Our Caledonian Discovery cruise would be kind of like a river cruise, except we would be following the Caledonian Canal, cruising through some of the lochs of the Scottish Highlands, including the famous Loch Ness. We would be sailing on a barge with a crew of four and ten other guests. Our room would be small, with a bunk bed no less. 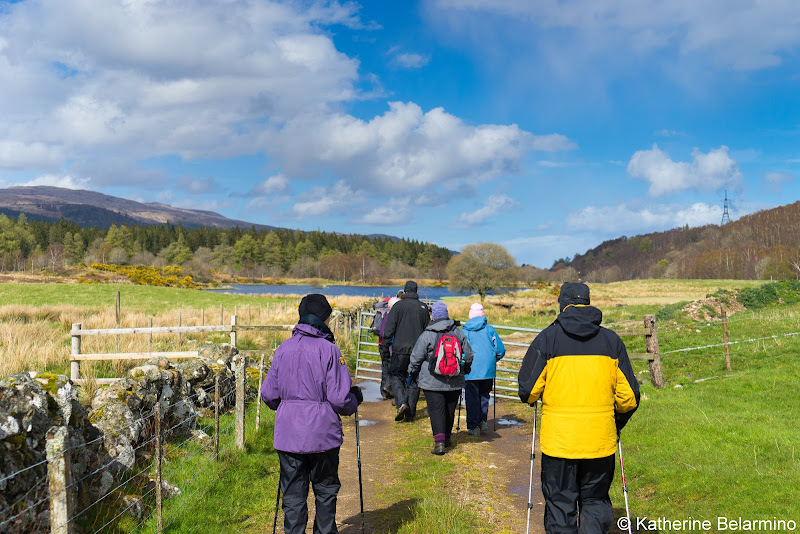 We knew the main draw of the cruise would be exploring nature in the Scottish Highlands. We would be able to walk, hike, bike, canoe, and even sail. But what would it be like traveling for a week on a small boat, in a small room, with a small group of people in very intimate quarters? We were extremely excited for this new adventure, but a little nervous as well. What we found was a truly memorable travel experience that we enjoyed so much, we wished it would last just a few days longer. 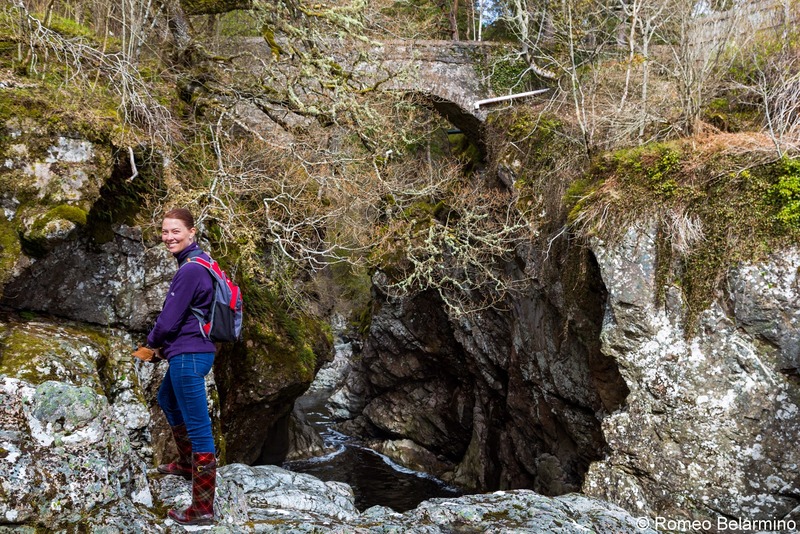 So, as we think everyone should enjoy the Scottish Highlands in this way, here is what you can expect on a Scotland cruise with Caledonian Discovery. Caledonian Discovery has two barges, the Ros Crana and the Fingal of Caledonia. Our barge was the newer Ros Crana. The Ros Crana barge was purchased in Holland. As soon as the deal was made and the paperwork was signed, owner Martin Balcombe had it cut in half, four feet removed, and put back together. It is perfectly sized to sail down the canal as well as fit into the locks. Play your cards right and you can even take a turn at driving the barge. Actually, when the barge is in the open waters of one of the lochs, guests are invited to visit the wheelhouse, bring the skipper or first mate a beverage, and take the wheel. I was surprised by how much pull there is. When I was holding the wheel steady, every once in a while there would be a strong tug on the wheel. It literally felt like a ghost was trying to steer it the opposite way! 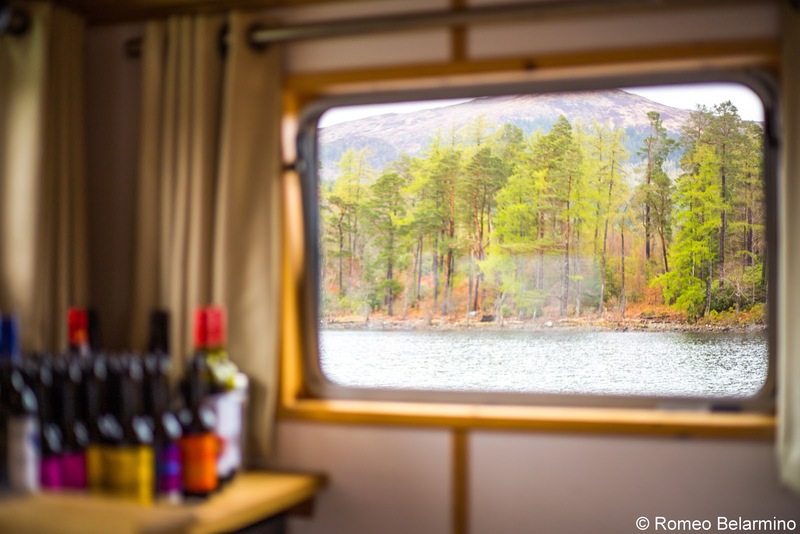 Cruising the Scottish Highlands in a barge means you can travel through the Highlands slowly, yet stay unpacked and never have to change hotel rooms. This is, after all, one of the main appeals of a cruise of any kind. Most nights the barge is docked, meaning you can get on and off. A few times there were places to wander at night One stop had a pub in a boat just across the canal, and another night we were docked in Fort Augustus, a small town along the Caledonian Canal. There were also a couple of nights that we dropped anchor in a bay of a loch. A canal barge is not a huge ocean cruise ship. They rooms are tiny, but it works and they somehow manage to be completely comfortable despite their small size. The Ros Crana is just a little bigger than the Fingal of Caledonia. 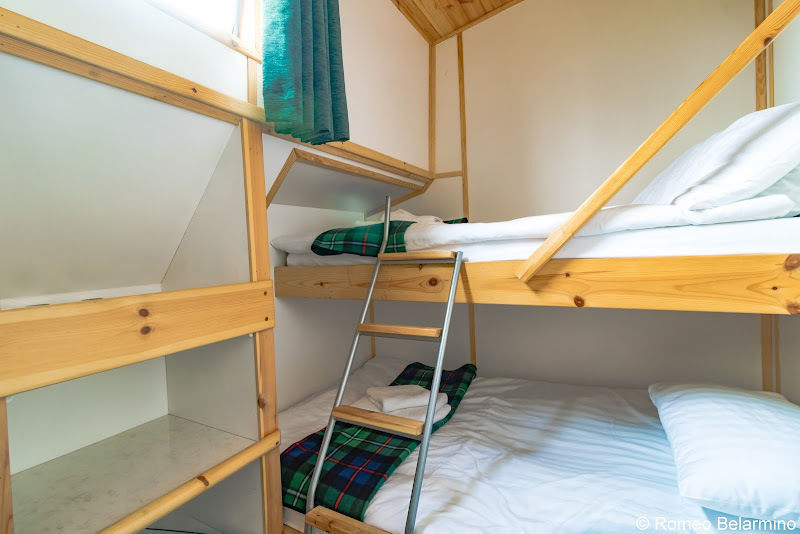 The difference this makes is that the bottom bunks in the rooms of the Ros Crana are big enough for two, while the bunk beds on the Fingal of Caledonia are true twin bunks. Some passengers traveling as couples still chose to sleep in separate bunks, but we found the bottom bunk, about the width of a double bed, quite comfortable for the two of us. This freed up the top bunk for storage of our suitcases, camera equipment, etc. Beyond the bunk beds, the rooms have small closets with rod and hangers, shelves for storage, and hooks for hanging coats. There are also hooks in the hallway outside of each room for bulkier coats, life vests (floaty coaties), and bike helmets so these items are close at hand but don’t take up space inside the room. An all important feature of the rooms is that they have private bathrooms. We don’t always require luxury accommodations, but we do insist on our own bathroom. Call us spoiled, but sharing a bathroom with strangers is not our idea of a good time. The sink and mirror are in the room, and then in the bathroom is the toilet and shower. 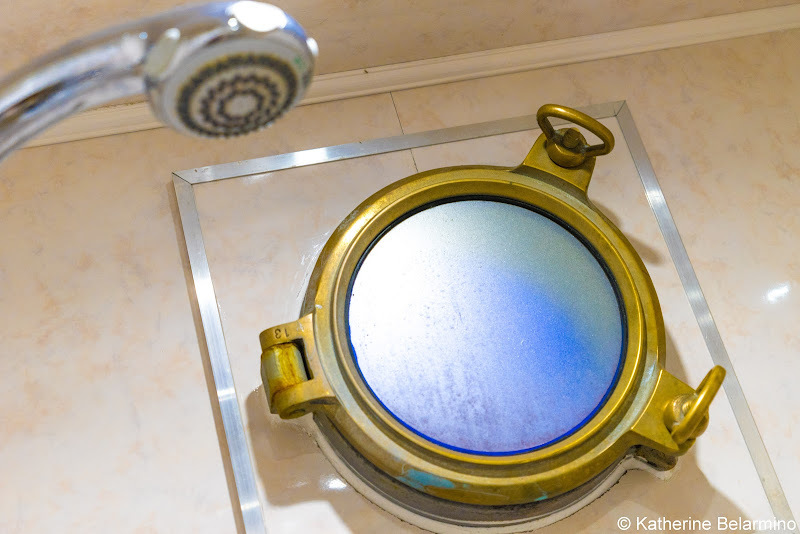 Guests rave about the showers, and for good reason. The shower was bigger than many we have encountered in European hotels, which was a surprise considering the comfortable but compact quarters. Also, the water was hot, never turned cold, and the water pressure was strong, all qualities I didn’t expect on a barge. They were very thoughtful when they arranged the lighting in the rooms. There is a main light in the room, a separate light over the sink, and reading lamps in the bunks so you don’t have to get out of bed to turn out the lights. There are also two outlets for charging electronics and using the hairdryer. The generator is turned off at night, so we made sure to charge our phones and camera batteries during dinner. One thing that was a little odd, but not at all a problem, was that the room doors didn’t have locks. We never asked about this, and there might be a reason for this. However, with such a small group, there was never a need to worry. The bathroom doors do lock from the inside. One thing that is different from staying on a standard cruise ship or in a hotel is that no one comes in to clean the room every day. While I do like to have my hotel room cleaned and tidied, I was glad our rooms were left to us. After all, there are only four crew members on the boat and they’re busy driving, cooking, and leading adventures. New towels were offered halfway through the cruise to any who wanted them. Speaking of the crew, let’s talk about them. The crew on the Ros Crana was phenomenal. 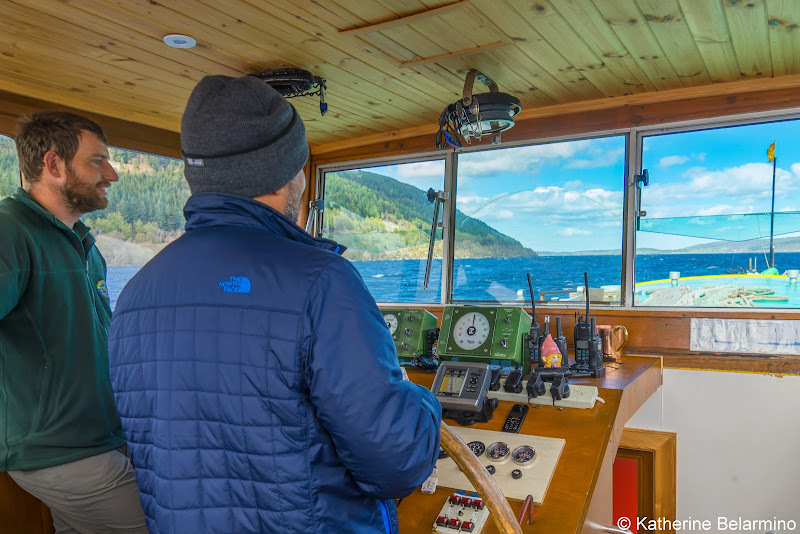 Martin Balcombe, the owner of Caledonian Discovery, was our skipper and was usually driving the boat and doing whatever else a skipper does. Chris Absalom was the first mate. He drove sometimes too and he was responsible for leading canoe trips and guided hikes and taking guests out for a sail. Lucy McGhee was the bosun, or boatswain. She’s in charge of fixing anything that’s broken or, as Martin joked, breaking anything to fix it. She also drove the RIB and shuttled guests between the barge and shore when we were anchored. Simon Wilkinson perhaps had the most important job of all. Simon was our chef and he was in the kitchen morning to night preparing us three full meals a day plus snacks and treats. He did have a little help for the first half of our cruise as he was training a new hire, Kevin. 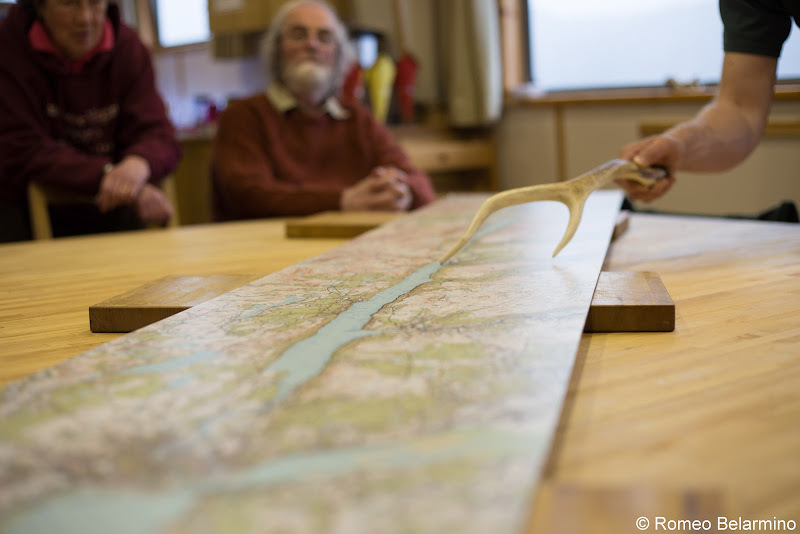 Every night after dinner, Martin or Chris would bring out the map of the Caledonian Canal, reiterate what we had seen that day, then talk about what we could see the next day, providing options for hiking, biking, canoeing, etc., and letting everyone decide what adventure they wanted to choose for the next day. The crew was always happy, cheerful, and helpful. We were exhausted at the end of every day, yet they not only would join our meals and some of our activities, they were also always constantly working behind the scenes doing who knows what to make our journey perfect. I truly don’t know how they do it. We used to avoid group travel. 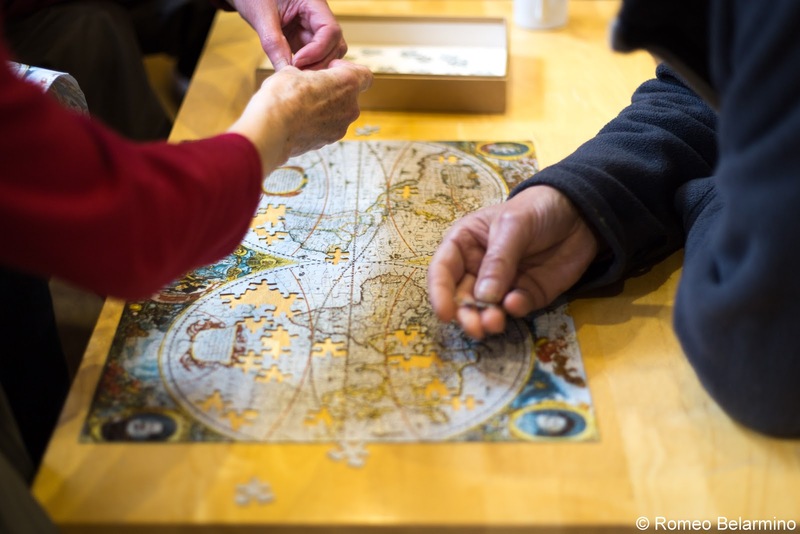 We still prefer to travel independently for the most part, but we have learned that some of the best travel experiences can be had with a small group of like-minded travelers. (An example is our off-road trip through Central Greece.) This proved to be the case with our Scotland cruise. Cruising with Caledonian Discovery is the epitome of small group travel. 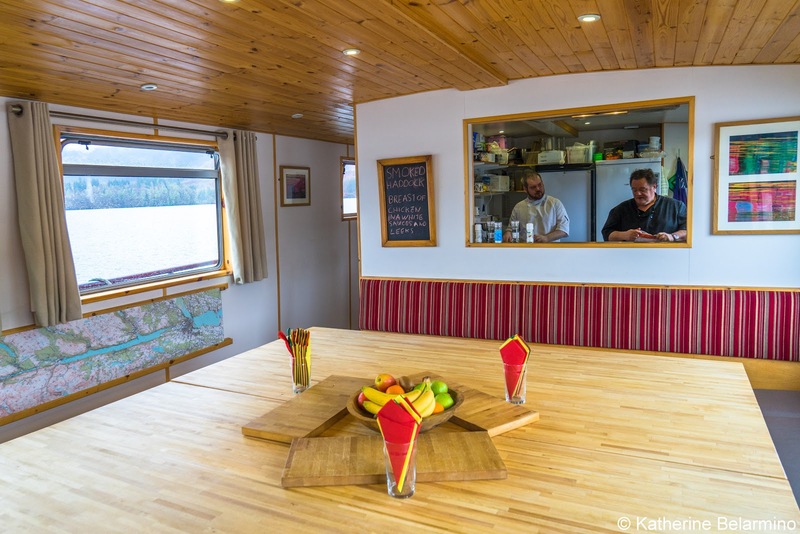 In addition to the four crew members, the barge can carry up to 12 guests. Everyone eats breakfast, lunch, and dinner together around a large square table. The good news is that you don’t spend 24 hours a day with each other. While there are a handful of group activities offered, like hikes and canoe trips, these are optional and, for the most part, we would be off on our own whenever we were docked or anchored. 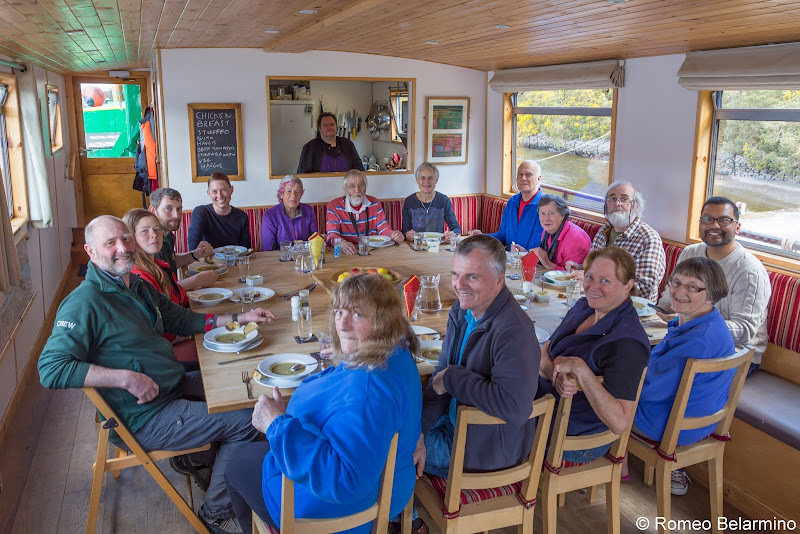 However, we did quickly grow to love the company of the other guests, so we would hang out in the barge’s living room area talking, putting together puzzles, and reading, and when the opportunity arose, a few of us would head out at night to visit one of the local pubs. Most of the guests lived in England, a few lived in Scotland, and one couple came all the way from Australia. While most of us were cruising with Caledonian Discovery for the first time, a few were repeat guests. All of the guests were active, constantly out walking, hiking, and biking. 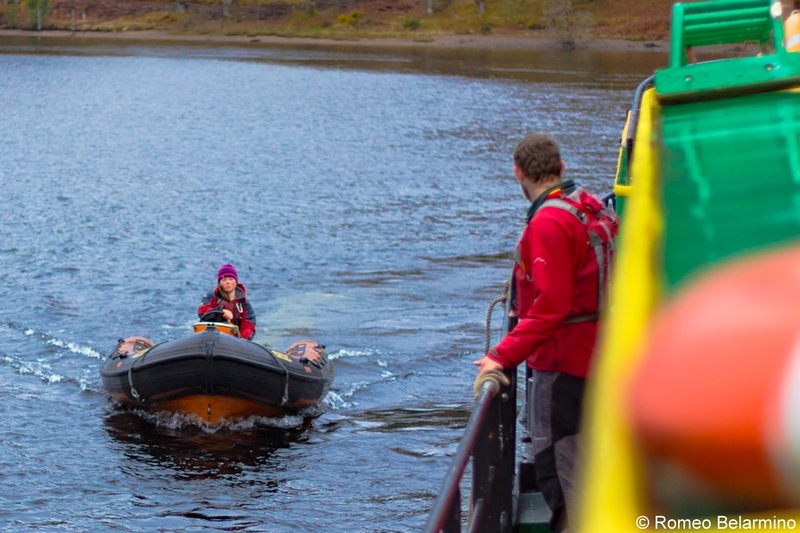 One couple, who actually live in Invergarry in the middle of the cruise's route, try to sail with Caledonian Discovery once a year, though it sounded like they might try to fit in a second trip this year. It was wonderful having their added knowledge of the area and the history and Hector became an inspiration to me when he told me he bought himself a canoe for his 80th birthday. As mentioned, guests of Caledonian Discovery are fed three full meals a day, plus the occasional snack and treat. Breakfast started with porridge, either a regular human-sized portion or a baby bear portion. Then came a passed breakfast that varied every day but could include eggs, toast, bacon, sausage, fried tomatoes, etc. Lunch usually started with soup followed by something like quiche or a tart. Two choices were always offered for dinner, one a vegetarian option and the other a meat or seafood option. 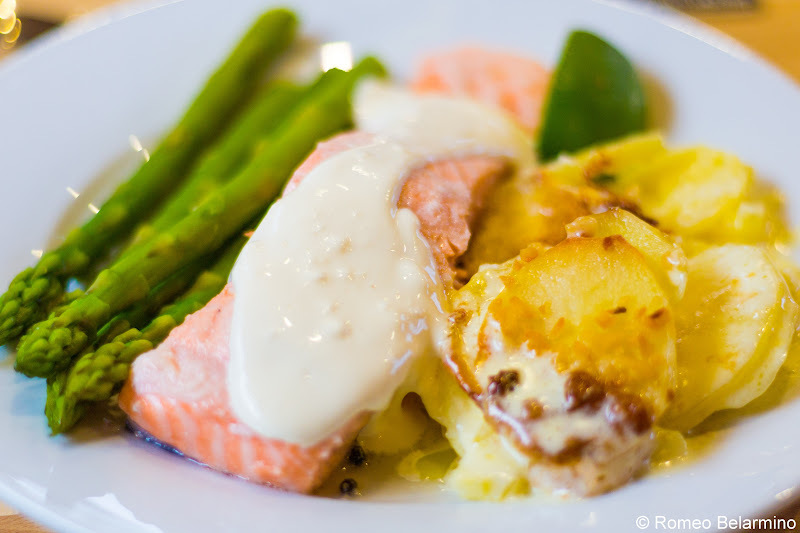 Some of my favorites included poached salmon with a lemon sauce and our final night’s dinner of chicken stuffed with haggis, which truly was a delicious combination. Simon pretty much told Romeo to man up (jokingly of course as they had become chummy) when Rome tried to ask for chicken without the haggis. Rome was happy he had manned up. Dinner was always followed by dessert, like the tart, thick, and creamy lemon posset made with lemon, cream, and condensed milk. Dessert was always followed by a cheese course, providing a chance to sample some local cheeses. I don’t know where he found the time, but sometimes Simon would make a treat like banana bread or muffins to be enjoyed in the middle of the day with tea or coffee. There were also cookies (or biscuits in the UK) available. Water, tea, and coffee were always available. There was also a bar with wine, local beer from Loch Ness Brewery, and sodas, like the unusual Scottish soda IRN-BRU, available at all times. We just needed to track our drinks in the folder and pay our tab at the end. 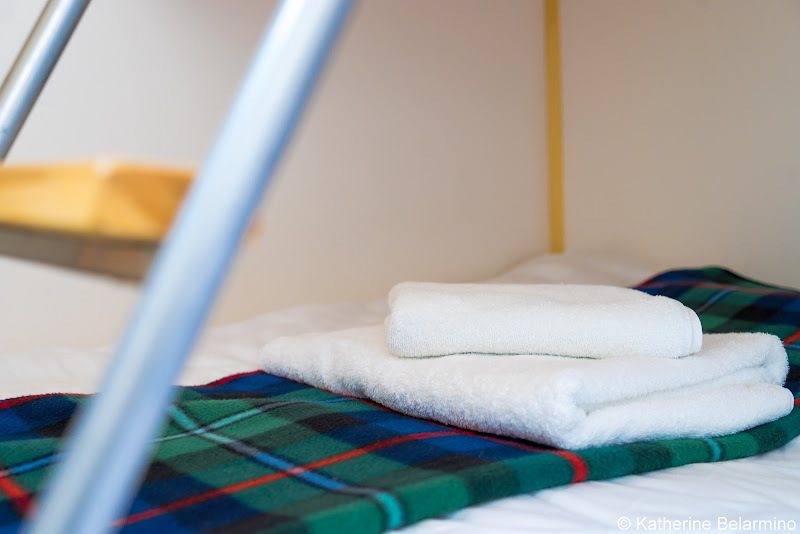 Caledonian Discovery makes sure their guests are their top priority. This is also apparent in the care they take to make sure everyone can enjoy the meal. 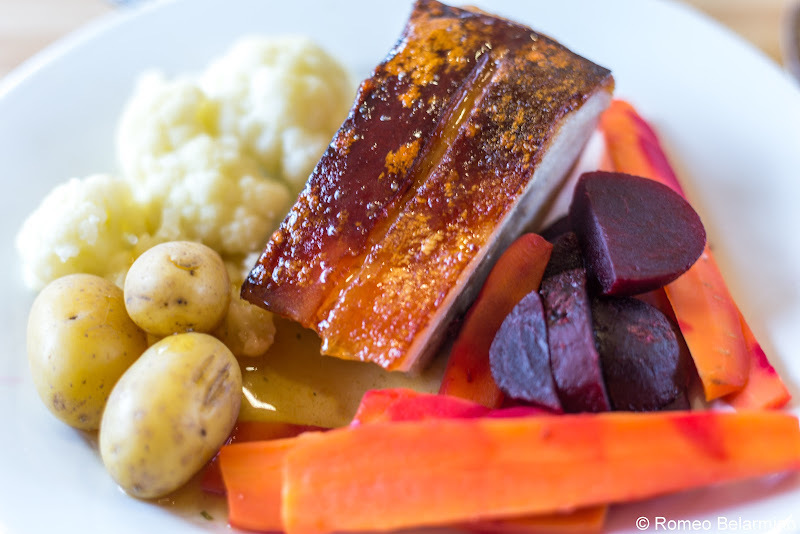 There is always a meat option and a vegetarian option for dinner. But beyond that, we not only had a few vegetarians on our cruise, we also had a guest who could not have any dairy. There were items like soy milk, margarine, and other non-milk options available for her, and she even received special desserts and sauces so she wouldn’t feel left out. The number one reason to cruise through the Scottish Highlands with Caledonian Discovery is to explore nature the way it is meant to be enjoyed, slowly. 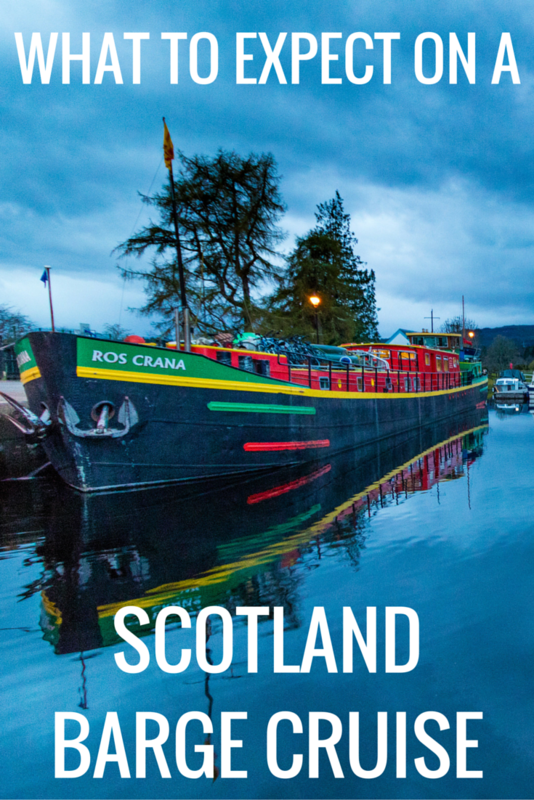 On this Scotland cruise, you can travel as much or as little of the Great Glen on your own power as you want. Even on the very first day, after we dropped off our luggage, we were able to cover the first leg of our journey on foot, meeting the barge a few miles down the canal. Every day can bring a new adventure. Walking along the canal is always an option. There are also places to take hikes to rivers, waterfalls, and castles. If you don’t feel like walking, there are plenty of other options. 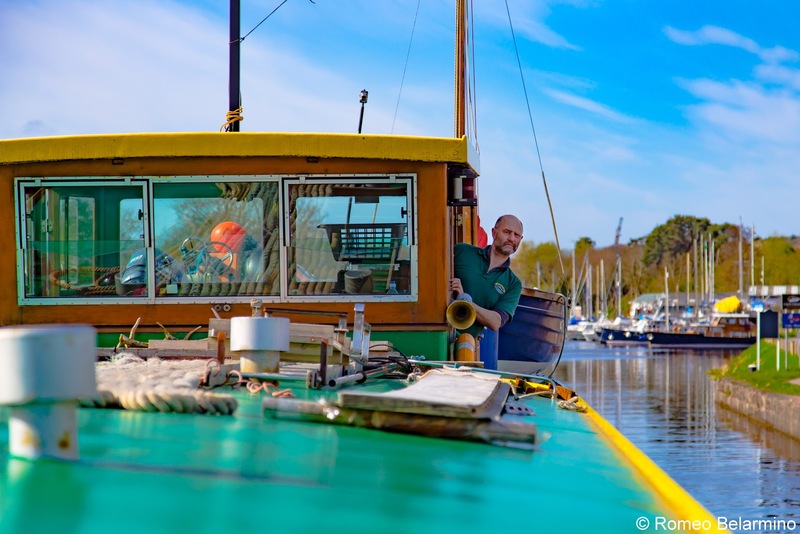 The Ros Crana had all sorts of toys aboard including canoes, bicycles, and a tiny sailboat. Bicycles can be taken out for easy rides along the canal, or longer, more challenging rides with lots of hilly bits. As I said before, you can do as much or as little with the rest of the guests as you want. I wondered if we would always be together, but outside of cruising and mealtime, we were mostly on our own. There are usually a number of activities from which to choose every day and walks, hikes, and bikes are usually a solitary activity, though there were two guided group hikes offered. Scotland is a land of spectacular examples of innovation and engineering. One of these examples is the Caledonian Canal, with which we became intimately acquainted during our week with Caledonian Discovery. 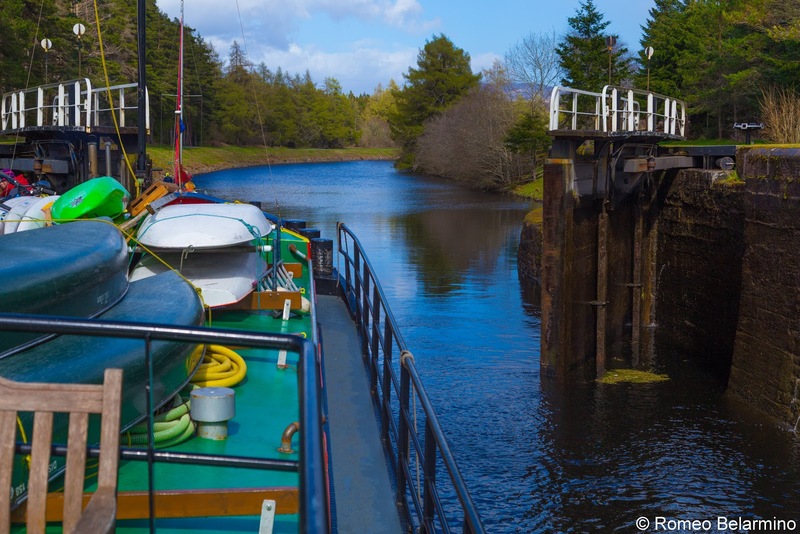 The Caledonian Canal is over 96 kilometers long. Approximately 35 of those kilometers are manmade while the rest are natural lochs. Scattered along the length of the canal are 29 locks which help boats ascend and descend as they travel along the canal. The canal is also spanned by 10 swing bridges. 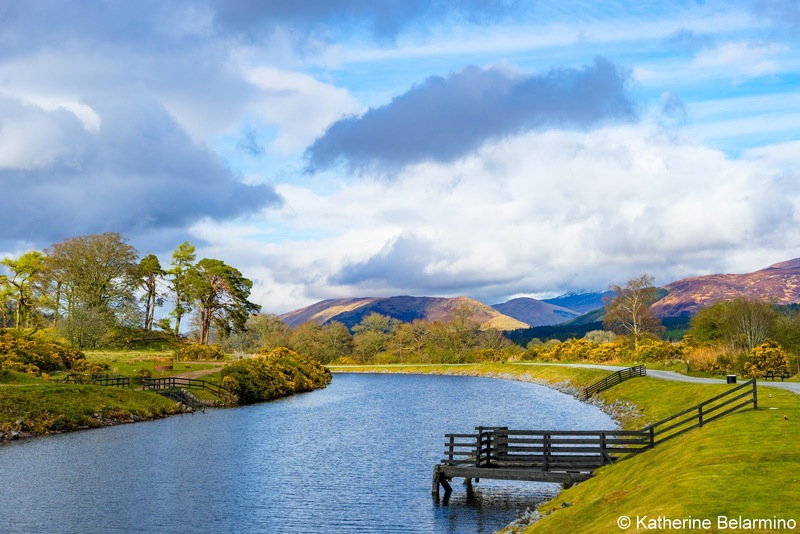 The idea of the Caledonian Canal started in 1726. 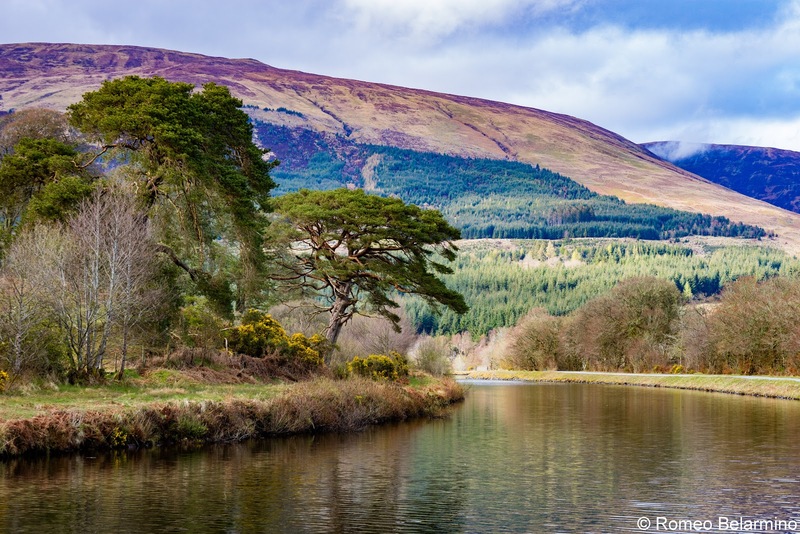 The canal follows the Great Glen, a natural fault which divides the Scottish Highlands with its lochs. Thomas Telford, a Scottish civil engineer, designed the Caledonian Canal and construction occurred between 1803 and 1822. The canal was dredged with the help of horses, and steam pumps pumped the water out. The canal provides a shortcut through Scotland from the Atlantic Ocean to the North Sea. The original purpose of the canal was to allow the safe passage of warships. 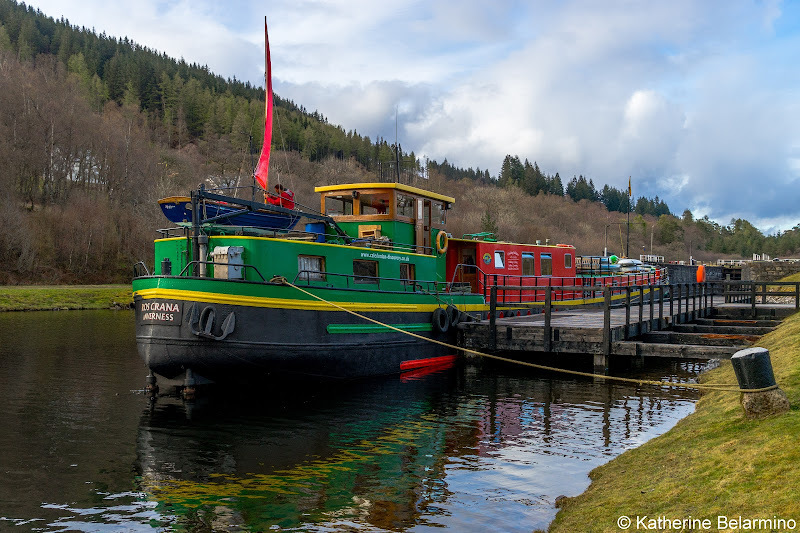 However, while it was used for World War I, the Caledonian Canal has been used more for trade and pleasure. 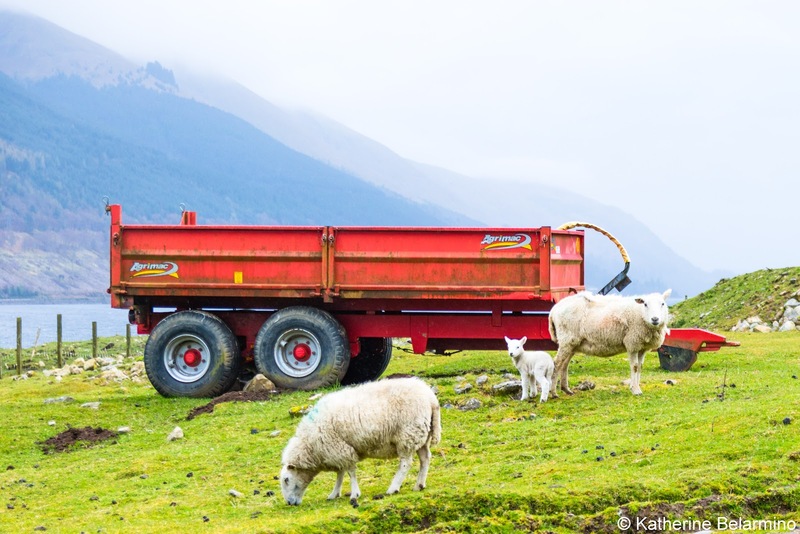 During our cruise, we were made acquainted with a Scottish Highlands cruise vocabulary. Terms that were thrown around during the week were floaty coatie (life vest), sporty sail (somewhat windy and choppy sailing), hilly bits (some hills to be expected), undulation (more extreme hills to be expected), and clearing rain (the kind of rain that comes pouring quickly and heavily to clear the sky of all its moisture). We also learned how to predict the weather in the Scottish Highlands. If you can see Ben Nevis, it’s going to rain. If you can’t see Ben Nevis, it’s raining. Since most of the guests were UK residents, except for the one Australian couple, we spent a week learning each other’s vocabulary and customs. For instance, we learned about pants versus trousers. In the UK, pants are your underpants, so if it rains and you say your pants are wet, everyone will laugh at you because it sounds like you had an accident. We had neeps and tatties and they were surprised (a) that we didn’t use that term and (b) that turnips are not terribly common on the US dinner table. While most everyone knew all about how it was lambing season (there were baby lambs everywhere), they were surprised we don’t see sheep all the time where we live. We learned about marmite, not to be confused with vegemite. 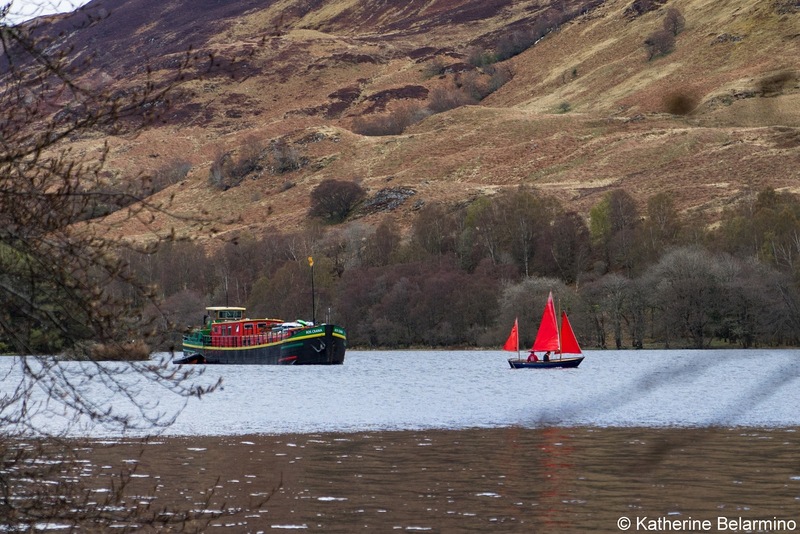 The section between Fort Augustus to Fort William has the most beautiful scenery of the Caledonian Canal. The lochs are smaller and more scenic at this end. 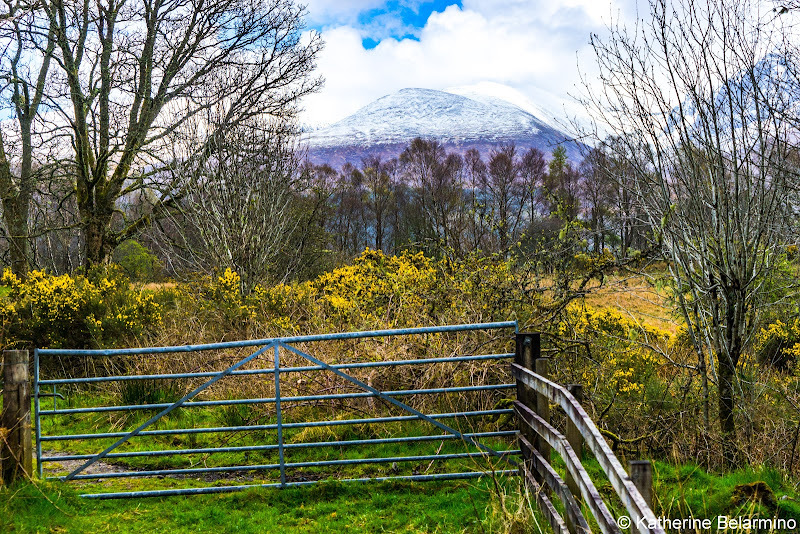 Therefore, if you are one who likes to save the best for last, you may prefer to choose the cruise that starts in Inverness and ends in Fort William. If you are arriving by rental car, starting from Inverness is also the best choice as rental car companies have return offices in Inverness but not in Fort William. Not knowing this ahead of time, we had to drop off our rental car in Inverness (we booked our car with Auto Europe) and then take the bus (which should be booked ahead of time with CityLink), a two and a half hour drive, along the shore of our upcoming Scotland cruise route to meet the barge in Fort William. The Fort William bus stop is at the Fort William train station, where we were able to then catch a taxi that took us the short drive to Neptune’s Staircase where we boarded the barge. However, if you are arriving by train and then taking a Scotland road trip afterward, the Fort William to Inverness route will work better. It rains a lot in this part of the world. We visited in May and had pretty spectacular weather for most of our time in Scotland, which is unusual. In the Highlands along the Caledonian Canal, clear weather every day is pretty much a miracle. We were actually quite lucky with our weather during our Scotland cruise, but it did rain and hail a few times, one time so much the back of my pants, I mean trousers, was soaked through while the front was practically dry since the rain was being driven so forcefully at an angle. Rain also means mud. Pack warm clothing in layers as you can get pretty warm while hiking. While we suggest sturdy hiking shoes that are waterproof or at least water-resistant, I actually had really good luck hiking in my rubber rain boots. I was kidded about it a few times, but I was able to step into inches of mud and yet stay dry, plus have an easy cleaning job. I also brought a waterproof jacket, a very thin lightweight one that I could wear on its own or over my down jacket when it was cold. If you have them, also bring waterproof over trousers. However, the Ros Crana had a number of sets of waterproof over trousers and jackets for those who didn’t have any. The extra-small bright orange high-water over trousers looked awesome with my plaid wellies. One last thing to expect on a Scotland cruise with Caledonian Discovery? Expect to have a wonderful time and want to come back to the Scottish Highlands for another one. Thank you to Caledonian Discovery for hosting us on a Classic Cruise and making this post possible. As always, all opinions are our own. This article contains affiliate links. If you book through them, it costs you nothing extra and we earn a small commission which goes towards running this website and bringing you more travel stories.